April provides lengthening daylight and a continued dazzling display of Venus in the western sky after sunset. During the month daylight increases by an hour to nearly 14 daylight hours by month’s end in the Chicago area. 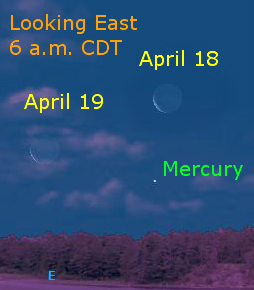 Mercury is a morning object throughout the month. From the northern mid-latitudes it lies low in the eastern sky during predawn hours. The moon is nearby on the mornings of April 18 and 19. On the first date, locate the moon, then use binoculars to find Mercury. This chart shows the evening appearance of Venus for 2011-2012. The chart shows difference between the time the sun sets and Venus sets. Chart compiled from US Naval Observatory data. Throughout the month, Venus continues its brilliant display in the western sky. The chart above shows the length of time between sunset and Venus setting. During the first several days of the month, Venus sets nearly seven hours after sunset. From that point until mid-May, when it disappears into the sun’s glare, it rapidly sets earlier each night. Venus is quickly catching Earth and will pass between Earth and the sun in early June. 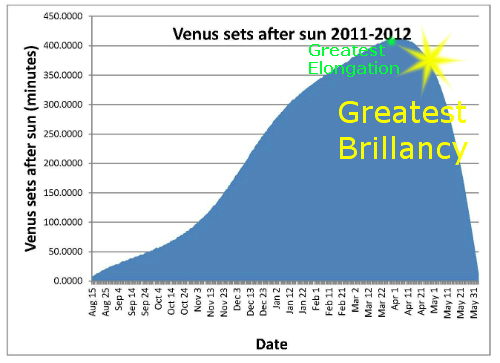 Venus reaches it greatest brilliance on April 30. At this time, Venus is 12 times brighter than Jupiter. A planet’s brightness depends on its distance, its reflectivity and its phase. (Planets display phases similar to the moon. 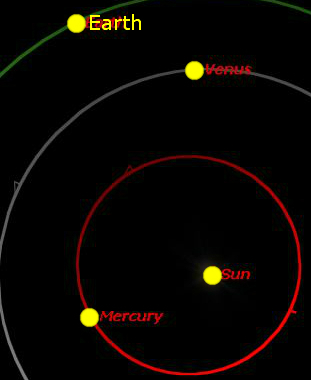 Mercury and Venus display crescent phases, but the other planets do not.) The chart above shows the inner solar system and the proximity of Venus and Earth when Venus is at its greatest brilliance on April 30. In this view, the planets move counterclockwise. 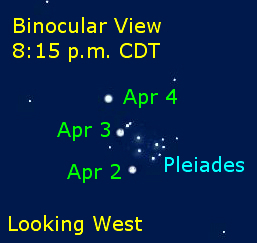 Early in the month, Venus appears to pass the Pleaides star cluster. In a dark sky the Pleiades are visible to the unaided eye. For those readers who live in areas with many lights, use binoculars to locate the planet and the star cluster on the evenings of April 2-4. The grouping can be photographed. Use the manual setting on a camera with the aperture setting the widest setting (lowest number). On a tripod, make a 30 second exposure. Venus and the stars will appear on the processed image. The moon returns to the evening sky late in the month as Venus is at its greatest brilliancy. 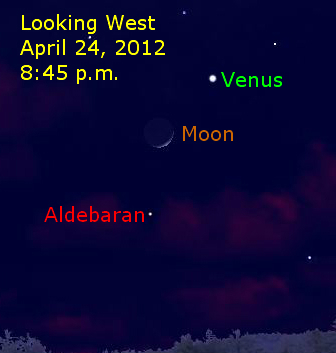 On the evening of April 24, the moon appears between Venus and Aldebaran, the brightest star in Taurus. Mars is high in the eastern sky at sunset. 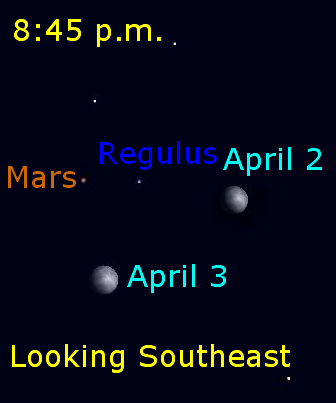 The chart above shows Mars, the star Regulus, and the moon at 8:45 p.m. CDT. As our planet rotates during the night, Mars appears farther to the west during the night as it sets in the west during predawn hours. During the month Jupiter rapidly disappears into the sun’s glare. 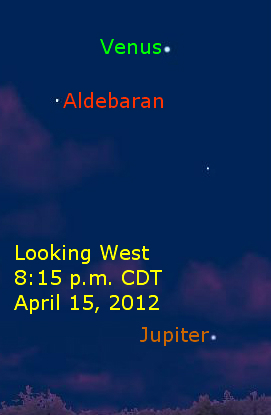 The chart above shows Jupiter at 8:10 p.m. CDT on April 15. Notice the great separation between Venus and Jupiter on this date. Jupiter goes behind the sun (conjunction) on May 13 and reappears in the morning sky later in June. Saturn reaches opposition on April 15, entering the sky at sunset. (At opposition the sun and planet are on opposite sides of the sky as the earth passes between the planet and the sun.) When a planet is at opposition, it rises at sunset, appears in the south at midnight, and sets in the west at sunrise. 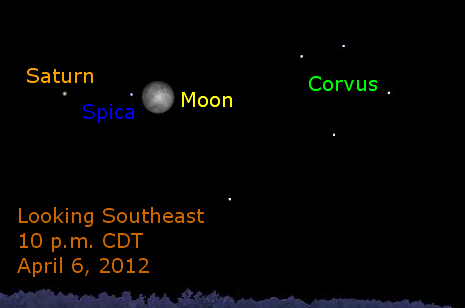 The chart above shows Saturn, the star Spica, and the moon on April 6, 2012 at 10 p.m. CDT. Even though Saturn is larger than Venus and Earth, its great distance diminishes its brightness. Venus is nearly 100 times brighter than Saturn during the month of April. This chart shows the positions of the planets visible without a telescope or binocular on April 15, 2012. (Click the chart to see a larger image.) Notice that Earth is between the sun and Saturn (opposition). Venus is about to move between the Earth and Sun. Reblogged this on ABC Astronomy. I hope you don’t mind, but I’ve reblogged this post on ABC Astronomy… if that’s not okay, please feel free to email me at thelastsongiheard@gmail.com and I’ll be happy to remove it.